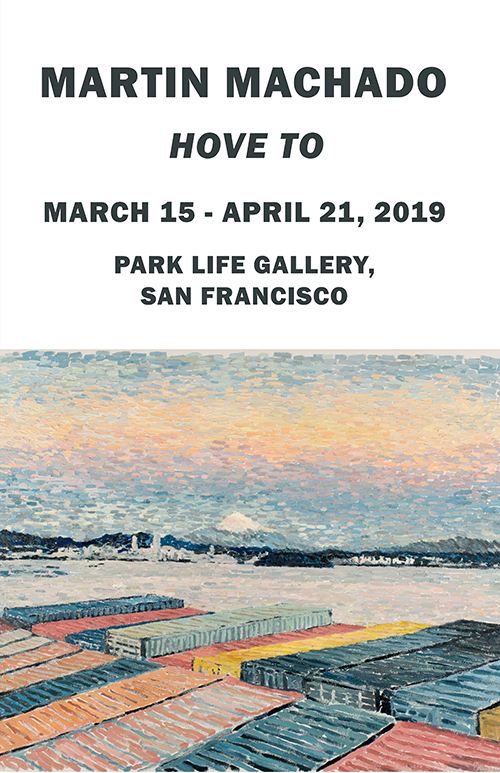 We are happy to announce Martin Machado’s exhibit Hove To opens at Park Life Gallery on March 15th, 2019. This will be his first show at Park Life. Being Hove To is a nautical term for having one’s forward sail intentionally backed to counter the pressure of a main sail. With the two opposing forces balancing themselves out, the boat essentially comes to a stop, save for the drift. Used by some to weather a heavy storm; while hove to the sailor does not need to steer the vessel, giving them the chance to make repairs, eat, mend an injury, or take a much-needed rest. Machado presents a suite of recent oil paintings, most of which were painted in some part on site. Many of these paintings are tied to labor, through his travels as an international merchant mariner on containerships and as a commercial fisherman. Others were worked out on a small sailboat during short solo voyages upon San Francisco Bay, from a row-boat, or simply from the shoreline. Throughout these works are dualities and the struggle to find balance between: labor and leisure, home and work life, nature and industry, color and form, progress and stasis. In addition to the exhibition space of paintings, Machado has created an immersive installation in the form of the living quarters of a fictitious sailor on a modern merchant ship. Playing with scale, a small bed invites visitors into a space that is both intimate and industrial. On a small beige wall is a porthole behind which a monitor plays film clips from Arthur Thanash, a San Francisco based mariner now in his 80’s, who filmed his experiences at sea starting in the 50’s, a pre-shipping container era. The rest of the space is filled with contributions from other artists, sailors, surfers, commercial fisherfolk, and amateur scientists. Machado states “I wanted to have an element of community for this show, so I decided to create this installation and reach out to a wide maritime community to help fill the space and create an identity for a fictitious character.” Contributors include: Alexis Amann, Stephen Amato-Salvatierra, Corey Arnold, Ben Ashton, Matthew Bajda, Bill Daniel, Futurefarmers (Joe Riley & Audrey Snyder), Carrie Hott, Robert Lepur, Patrick Trefz, and Kanoa Zimmerman. Martin Machado is a visual artist based out of San Francisco, CA. His artwork is largely influenced by his experience with maritime labor, spending portions of his year working on international containerships and commercial fishing vessels. These voyages and the crew he works with have become intertwined with the narrative of his artworks. His work has been shown internationally and has been featured in The San Francisco Chronicle, The New York Times Magazine, Juxtapoz, and New American Paintings. Martin has an MFA from the San Francisco Art Institute.